Buying the things you need in life quickly is essential if you want to live on the go. But that doesn't mean you have to spend a lot for things like food, water, clothes etc. And thus led to the super success of Walmart. Walmart is a department store that people go to in order to purchase more things with the budget they have. Usually people prefer to shop at Walmart because they offer very competitive prices which are always lower than the prices found at your local area stores. Their strategy is to survey the prices around that particular area which is fifty miles in diameter and they either sell their products at the same prices as local stores or cheaper. Pretty neat don’t you think? In 1962, a man named Sam Walton created the Walmart Corporation. It is originally known as Walmart Stores Incorporated, which is still true till today but is preferred by the public to be called Walmart. This is an American owned Corporation in the retailing industry that aims to sell goods to consumers at competitive prices lower or equal to the local stores around a specific area. Walmart received recognition from the NYSE (New York Stock Exchange) in 1972. In 2008, Walmart was also featured in the Fortune Global 500 saying that they were the biggest public corporation in terms of revenue. Today, Walmart is known to be the United State's largest private employer and grocery retailer. Ever seen those small Walmart's in your neighborhood? That's how the Walmart business began. It is called a normal Walmart discount store. In size, they are built at an average of fifty one thousand square feet to two hundred and twenty four thousand square feet. Although small in size, they are still able to offer consumers a wide variety of general merchandising and food items, plus other miscellaneous commodities like gardening centers, pharmacies, etc. These things vary from brand to branch. The first discount store opened by Walmart was in 1962 in Rogers, Arkansas. As time went by, Walmart took another huge step towards modern day shopping. 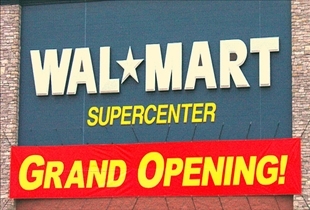 They opened up huge Walmart department stores called hypermarkets but are better know to the public as Super Walmarts. This is because the Super Walmart is bigger than the usual Walmart as they are built at an average of ninety eight thousand square feet to two hundred and sixty one thousand square feet. They offer the exact same products found at a normal Walmart, but they boast their own supermarket where you can buy just about anything! The first Super Walmart was built in 1988 at Washington Missouri. Well, the time has come for big changes. As a marketing strategy, Walmart plans to convert all normal Walmart department stores to a Super Walmart to attract more customers. Now, in doing so, consumers will have a place to go for one stop shopping, but will they lose customers at the same time? I'm asking this because compared to a normal Walmart, the prices tend to be a bit higher in a Super Walmart but still within the range of local stores. Only time will tell how this will work out. Walmart stores Incorporated was founded in 1962 by a man named Sam Walton. The first Walmart chain was opened in 1962 in Rogers, Arkansas and the first Super Walmart was opened in 1988 in Washington, Missouri. A super Walmart has all the products available at a normal Walmart but the difference being super Walmart's having their own supermarkets and more miscellaneous services. In the near future, not a single normal Walmart will be left standing as they will be converted to Super Walmarts. Which Walmart is in your neighborhood? Linda..... If you lost 1/2 your business from people who drive an extra 30 minutes to the Super Walmart for produce did you think that maybe, just maybe you prices were too high in the first place. Of course you're prices are and probably have been much too high for to long and your customers have finally gotten relief. This is the US and in our society compitition and free market prevale. If you didn't want Walmart their then you should have bought the property with all the extra money you had by overcharging your customers. I don't feel sorry for you at all. Your family and generations behind you have overpriced the overtaxed for generations. Thanks for Walmart and how they help those looking for a fair price. Maybe you should have been put out of business years ago.